Travelling alone? Do you like to meet other people? 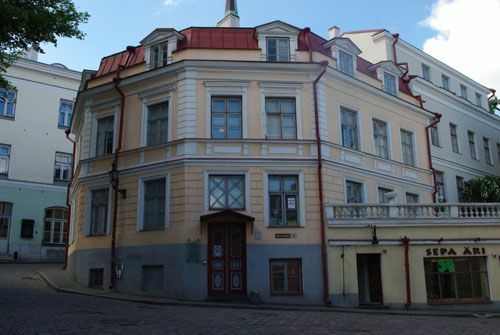 Then come and hang out with us at Tallinn Backpackers, Tallinn's coolest, most social hostel. In the heart of the Old Town, run by backpackers for backpackers. Tallinn's Old Town is small and with a map it won't be hard to find us. We are situated at Olevimägi 11. Coming from the harbour: The easiest way to get here is via Uus street. Simply follow Väike Rannavärav into the old town (it becomes Uus street) then take the first street on your right, which is Olevimägi. Our building is the yellow one on the big intersection at the end. Otherwise, if you find yourself at the Pikk street gate entrance (near the big Fat Margaret tower) walk into old town and take the first street on the left close to the big church. This will lead you to Sulevimägi street. Turn right and follow the block down and around the corner to the intersection and you will see our door in the yellow building on your left. Coming from the bus station: Take tram #2 outside the main entrance of the station 5 stops and get off at Linnahall. You will then be very close to the Pikk street entrance and can follow the directions from the harbour above. Coming from the airport: Take the bus 5 stops to the A. Laikmaa stop. You will see the Viru Keskus shopping centre. Walk through it and exit into the park. Follow the crowd and paths towards the old town, where you will see the Viru street gate towers next to a Hesburger restaurant. Walk through the gates, past McDonald's to the top of the street. Turn right onto Vene street and follow it to the end. We are in the yellow building straight ahead. Coming from the train station: Enter the old town via Nunne street (across the road). Continue following it until you see a big stone archway leading uphill on the intersection of Nunne and Pikk streets. Turn left onto Pikk street and follow it until you see a fork in the road. Take the downhill path and we are in the yellow building in front of you, on the big intersection. Coming by taxi: Taxis that you find on the street tend to overcharge. Try to negotiate a price with them and try not to pay more than 10 euros (150 EEK). If you can, it's much more reliable and cheaper to order a taxi to pick you up (pay attention to the car number that they tell you) and expect to pay 50-125 EEK, depending on traffic and whether you are coming from the harbour, bus station or airport. Coming by car: It's impossible to park in the old town, but the closest car park is just outside, on the end of Uus street. From there you can follow the directions from the harbour above.